« Glass vs. Epoxy: Divot! 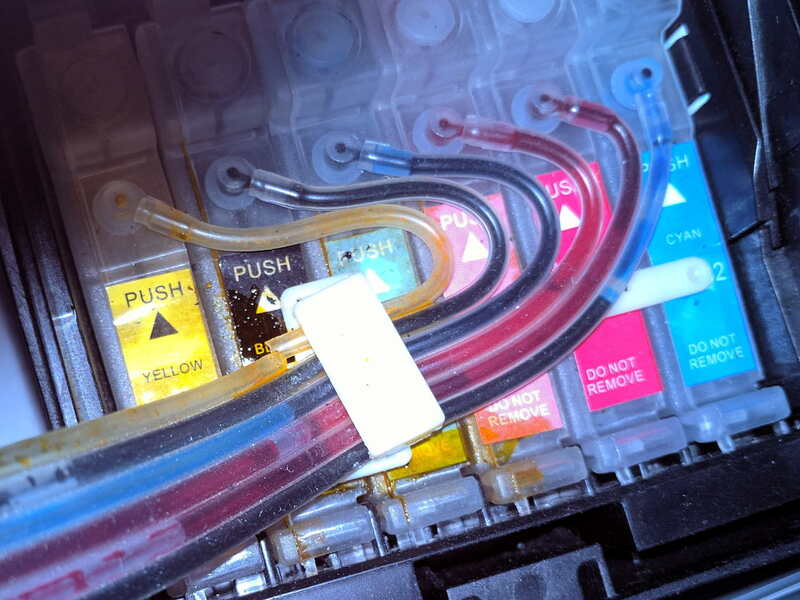 The yellow smudges in front of the tubing clamp and across the top suggest the total mess lying in wait between the cartridges. Donning my shop apron and wielding damp paper towels cleaned things up well enough. Although the failing yellow supply surely contributed to the problem, the printhead seems to be on its last legs after nearly nine years. 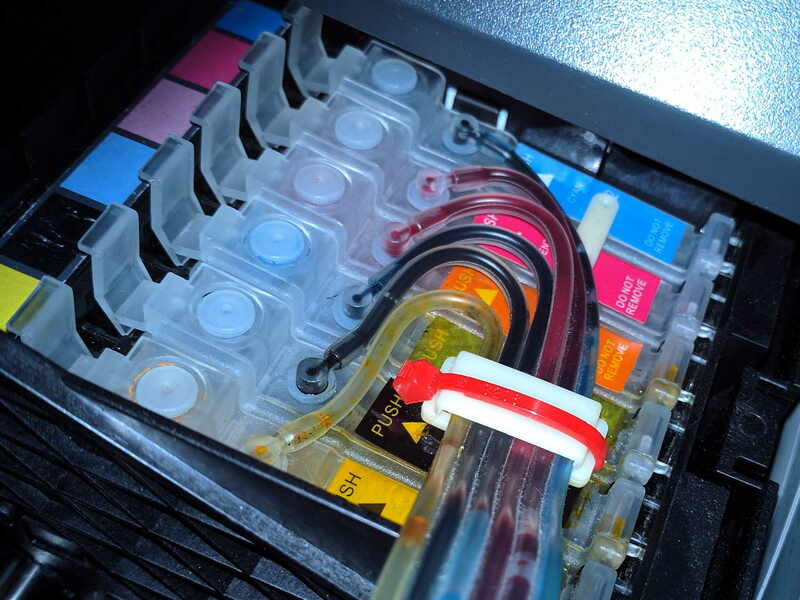 IIRC, I got the printer for $15 after rebate, spent maybe four times that on CISS tanks, and perhaps $200 on good-quality ink in pint bottles, it doesn’t owe me much. Maybe I shouldn’t buy ink in pint bottles any more. This entry was posted on 2017-10-11, 07:33 and is filed under Home Ec, Machine Shop, PC Tweakage. You can follow any responses to this entry through RSS 2.0. Both comments and pings are currently closed. About a year ago I decided to switch from my aging early-2000s Epson R220 + CISS to an LED printer (like a laser printer, but less moving parts). I’ve been quite satisfied with it. I got one with an ADF/scanner implement at the top and I got rid of quite a bit of old paper I didn’t really need but didn’t quite want to get rid of just yet. It’s now a collection of nice DjVu files part of my regular file backups. The printing’s good too. Oh yes, and Brother has good Linux support. The computer itself went to the recycling plant, but I definitely still have the IBM Model M keyboard. Dutch ISO model, unfortunately — US ANSI is a slightly less ridiculously right-unbalanced design, although it suffers almost as much from that defect. In any case, I think that dot matrix printer just might still be around somewhere. PS I actually think the IBM Model M is overrated. It’s too close to a real typewriter if you ask me, except without the annoyance of having to time your typing just right lest the letters stick. But the keys travel and you don’t have to ram them all the way down, so compared to your run of the mill keyboard it’s absolutely terrific. And, yes, clicky keyboards FTW. When the rubbery split keyboard I’m using wears out, I must take another look at mechanical keyboards. Last time around, I didn’t see a reasonable clicky split keyboard; the UHK remains Not Quite Real. Indeed! I like the full-on programmability, because the Kinesis not having keyboard volume control turned out to be much more annoying than I expected. Thanks for the pointer: it’s a possibility! I’ve been using the MS Comfort-curve keyboards since the 90s. The default board for the shop computer needs a key washing (bad Pete, shouldn’t eat at the computer), but the backup from a long-gone PII still goes on. The current machine uses a USB version, and it’s less sensitive to crumbs. No clicky, but it has a good feel. The keyboard in the 2012 vintage Dell 17R laptop has some dead-and-or-dying keys, “b’ and ‘2’, with [spacebar] going. I assume it’s a bad connection at the flex cable at best. Don’t want to dink around with it, so a Genuine Aftermarket keyboard is on its way. The only reason I switched to the Kinesis split keyboard was my old MS Comfort Curve pretty much wore out; I went through several of those over the years. Loved the hardware, even without the Special Windows Drivers. We occasionally turn the keyboards over and give ’em a good smackdown on the desk edge to release a shower of crumbs, dust, hair, dead bugs, and mysterious objects: scary stuff in there! The DPI switch can be quite useful. The low DPI setting is similar to my Kensington Expert Mouse Pro in speed, except it actually feels smoother and more precise. I’m not sure if this is due to the Expert Mouse being eight years old or whether it’s something more inherent. Medium seems most comfortable for regular use. I decided not to open up the mouse at this point in time — after all, it’s functioning perfectly — but the left and right click switches are clearly superior to all of the other buttons. Even those I actually like less than the switches on the Expert Mouse; they have less of a clicky feel to them. The scroll wheel is pretty decent and it also supports scrolling left/right in an awkward manner, but I think it’s pretty obvious that the perfect mouse would have two trackballs without any of these stupid scrollwheels. I think the obvious layout would be similar to the HUGE. A big finger trackball combined with a smaller thumb trackball. A switch similar to the DPI (but hidden on the bottom or something) would let you switch which you want to use for scrolling and which as a mouse. I’ve been using my Expert Mouse with the bottom left button as “scroll button” for years now and it’s smoother than any scrollwheel. Even though it’s just a touch too small (if only these ball sizes were interchangeable…) it’s almost more the ball itself that seems better than my Kensington ball. Sticking it in the Kensington Expert Mouse seems to feel smoother too! My conclusion, in principle this is inferior to the Kensington, but in practice it’s not. And that’s just too bad. Unfortunately the mousing direction is completely off in that case. The basic Kensington Expert Mouse design is fine. Get rid of the broken scroll ring (or make it actually work), replace the ball and sensor with those from the Huge or something much like it and keep the four Omron buttons basically the same. Being symmetrical is absolutely the key feature of the Kensington: nearly all other trackballs seem relentlessly right-hand-only. I’ll add a linky from the Kensington writeup to your comment. Although (or because) I’m left-handed I don’t really care about that too much. I like to switch it up occasionally though. Those Elecom guys also make a more Logitech-like smaller thumbball in both left and right-handed models, and the same goes for a smaller finger-oriented ball. I’m not too fond of the Logitech M570. The older Trackman or whatever it’s called and the newer MX Ergo are better. (All three of those are my wife’s.) I also have a Marble Mouse somewhere (that one’s mine) but I haven’t been able to find it in spite of turning up several mice I didn’t even know we had. I checked if they could be harvested for switches, but alas, only low-quality nonsense. Say what you will about the Kensington Expert Mouse, but at least the switches are good. I have to say these inferior secondary buttons on the Huge are a big disappointment for this otherwise excellent product. It completely takes away the option of experimenting with unintended button layouts, other than swapping left and right click. Of course it’s not like the Logitech offerings are any better; quite the opposite. But those don’t really have any buttons asking to be reassigned, whereas the Huge has a, pardonnez le mot, huge squandered potential.